Georgian President's Advisor Pikria Chikhradze has commented on the decision of the ruling Georgian Dream (GD) party – not to take part in the consultations for selecting the candidates of the Supreme Court Chair. “We desired that the parliamentary majority be involved in consultations for the selection of the Chairman of the Supreme Court. We hope that they get involved in the process at the next stage when a candidate will be selected,” Chikhradze said. She noted that the meetings with representatives of civil society organizations and rights watchdogs, as well as with political groups in the Parliament of Georgia are ongoing and they will be glad to see the majority members there too. "There are still several groups we want to meet and then we will move to the next stage, during which we will hold interviews with the selected candidates," Chikhradze said and added that a statement summarizing the consultations will be made next week. “The president used to appoint his employees at the high-rank posts in court regularly. This does not give us optimistic expectations. He [president] had his interests and was led by them,” Kobakhidze stated a few days ago. 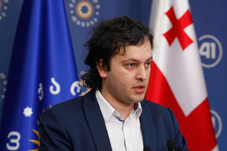 Deputy Speaker Tamar Chugoshvili added that it would not make sense if the majority gets engaged into consultations considering the “attitude” of the presidential administration. “It seems, real consultations between the two main actors – the president and the parliament – will not happen, so the president can continue the process on his own and present the candidate,” she stated. The post of the Supreme Court Chair became vacant when Nino Gvenetadze, 54, quit his post on August 2. Gvenetadze, selected for the role by President Margvelashvili and approved by parliament in 2015, said in a special statement that her treatment required a several-month stay abroad and announced and she had resigned due to health problems. She should have taken the post for ten years. The opposition says that Gvenetadze was being suppressed by those who did not wish to see genuine reforms in the court system. They believe that constant confrontations inside the court were the real reason for the resignation of the court chair.